If your little girl is just starting out in gymnastics or is outgrowing her old leotards, it can be difficult to know exactly what kind of leotard you should buy for her, especially if you’re shopping on a budget. Taking her own personal style and taste into account, you should consider some of these budget-priced leotards that are rated the top gymnastics leotards for girls. 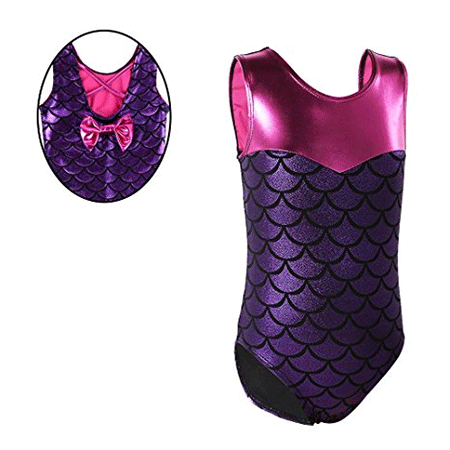 If your child is interested in yoga, ballet, or gymnastics, this sparkly leotard is a great choice. This fashionable one-piece is crafted from soft and comfortable fabric that allows for fluidity of movements. 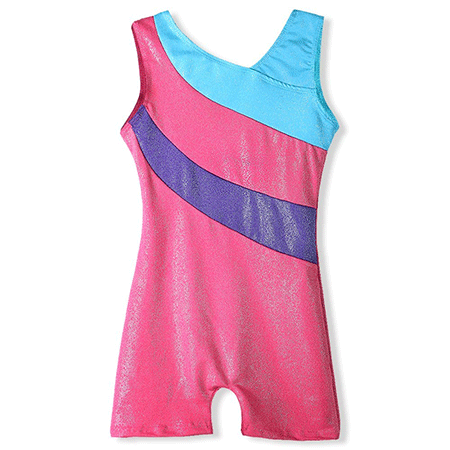 This polyester-and-spandex leotard is blue, purple, and pink and fits true-to-size for most girls. BAOHULU’s leotard is sparkly and features a cute bow and crisscrosses in the back to make your gymnast feel both stylish and comfortable. These leotards double over as swimsuits as they are made from the same materials. They are composed of 82% polyester and 18% elastane. If your gymnast is a fan of blue, this leotard might be ideal for her. While this leotard is sized for smaller girls, there are sizes available for bigger girls. This sparkly blue leotard has a double V across the chest area in pink and white. This long-sleeved leotard is designed with fashion in mind. The floral print on the top is nicely matched with gold fabric that swirls around mid-torso. The leotard is made from high-quality fabric and has stretchy material so that a girl can grow into it. 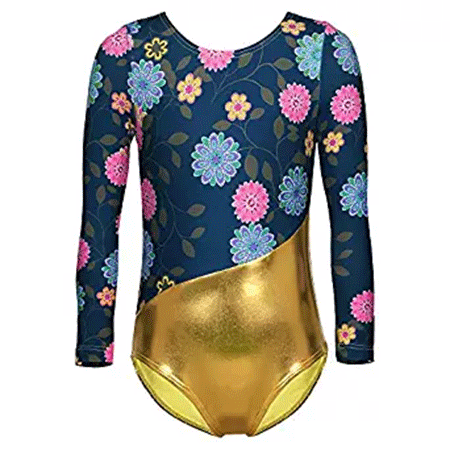 If your gymnast loves patterns but isn’t into florals, this shiny leotard is cute and artistic. Its stretchy fabric allows a large range of motions and is incredibly breathable, keeping your gymnast dry. The fabric is a nylon/spandex combination, and the bottom half of the leotard is covered in shimmery silver dots. The top half has rainbow-colored ribbons. This leotard is made from bright, shiny, and stretchy material. Its style is appealing for more mature gymnasts who want to look cute without the extra frills. This leotard has a lightweight design, and the stretchy fabric helps to keep your gymnast feeling dry. This leotard has a simple yet elegant design and has long sleeves. The material is comfortable and stretchy, allowing sufficient movement in the arms and torso. This leotard is tastefully cut, has shimmery black and pink paired together, and is made from breathable fabric. If your gymnast likes to have some fabric covering her thighs, this leotard is perfect for the job. It is cute and well-designed to keep gymnasts freely moving. 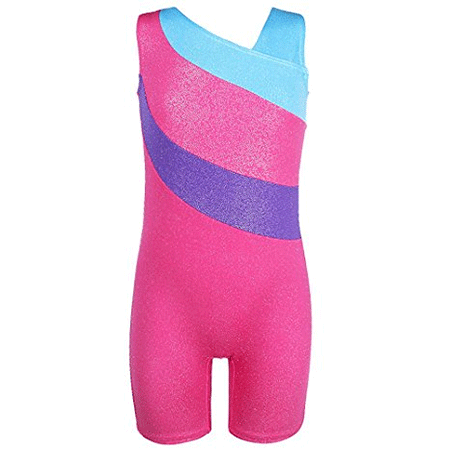 This pink, purple, and light blue leotard has a high cut in the front and comes down over the upper part of the legs. It is stretchy and dries quickly. This black leotard is trimmed with teal and purple shimmery material to give it a sophisticated edge. This might be a good fit for girls who don’t like pink. This leotard is made from spandex and polyester. The fabric is stretchy, keeps gymnasts dry, and can be machine washed. 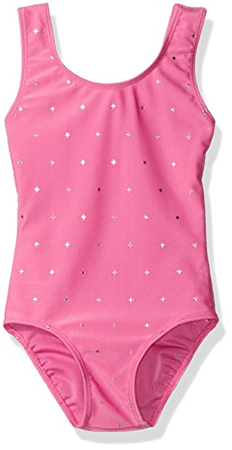 Danskin’s sparkle leotard is a great fit for gymnasts who love pink. This leotard can be machine-washed and is tastefully cut with a scooped neckline and backline. The fabric is a breathable combination of 84% polyester and 16% spandex. This leotard would also be ideal for dance or yoga.